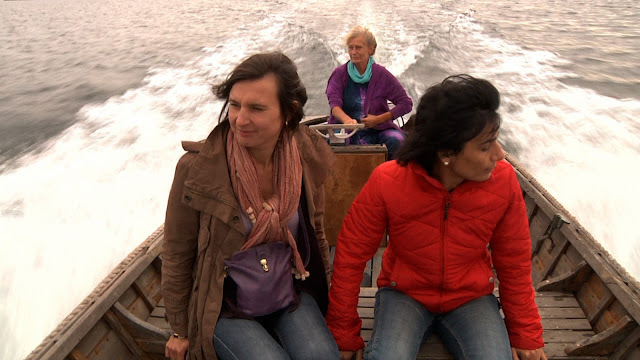 Monica Narula of Raqs Media Collective, from New Delhi in India, came to the archipelago on a very brief visit while travelling in Europe. This was to prove an amazingly productive speedy stop-over, while even allowing for wonderful sense of slowing down. This is the magic of the outer archipelago, such as the small picturesque island of Aspö, where just one evening can feel like a long weekend, under the stars with no light pollution and not a soul around. Elin’s second visit begun with a birds-eye view of the islands as she experienced her first of cruise ship between Stockholm and Turku. The week in the archipelago allowed for further and more focused research into the underwater ecology of the area. From alien species her interest shifted towards plants and their role in the complex marine ecosystem. The water was exceptionally clear this year and the visibility perfect for snorkelling. We were even greeted by a huge number of jellyfish that had just now appeared in the end of the summer – perhaps a good sign, as they apparently only thrive in healthy sea beds. Elin gained an insight into the research on sea grass from marine biologist Christoffer Boström and his team on a field trip around the outer islands of Turku archipelago. Taru joined in on another snorkelling trip, with Trygve Löfroth (Metsä) to Hästö underwater nature trail. We also got more insight about an ongoing research project, led in Korpoström by Heidi Arponen (Metsähallitus), that maps the sea bottom of the Turku archipelago and its various habitats. A visit to the Archipelago Research Institute in Seili and participation in the CAA discussion event on Ecology completed the picture of current marine research done in the area. In addition to the underwater worlds Elin got to visit the artist Anna Nyreen (also in CAA), her ceramics studio and gallery in a hidden corner of Nagu. The first visit of Nomeda and Gediminas coincided with the first glorious summer days of the year. Together with the artist Oliver Kochta-Kalleinen we left from Turku harbour in blazing sunshine on a military boat. 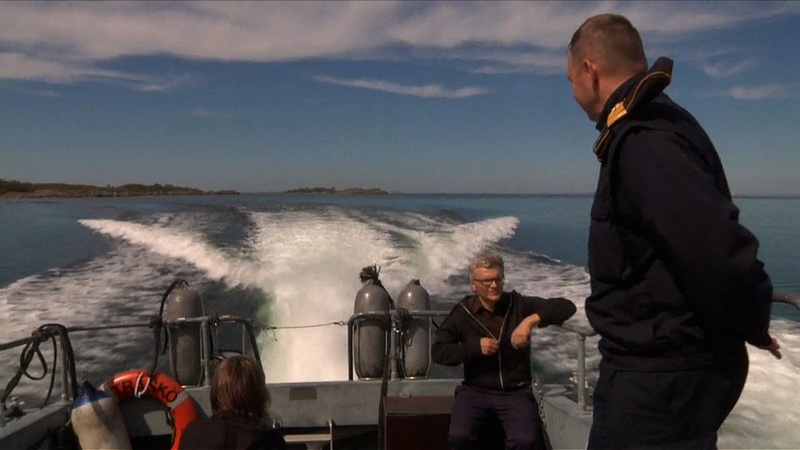 Commander Tapio Maijala took us on a guided tour of the archipelago, with the first stop by the army base of Gyltö in Korpo, soon to be partly closed down. 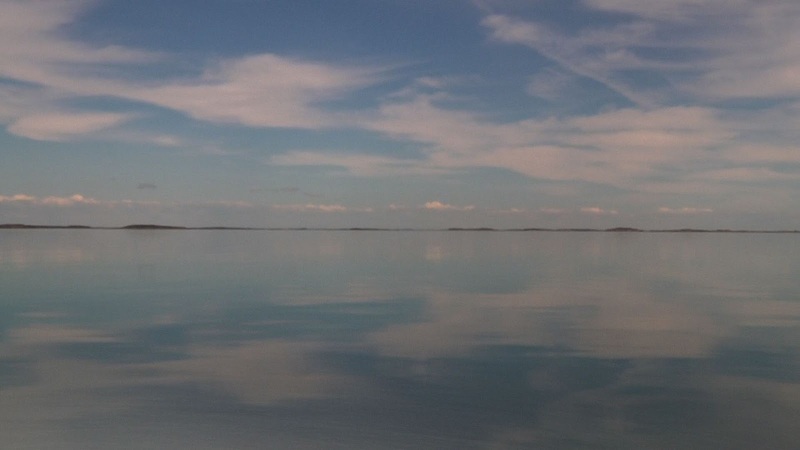 Riding through mirror-still seas we visited also the outer islands of Jungfruskär and ?? ?, both with military history yet now part of the national park. Our destination was Utö, which up until 2005 had a large army base. Its closure has had a huge impact on the local community, which now has turned to tourism as well as invites families to move to the remote island for a gap-year or two, in order to keep the little school alive. In Utö we learned more about the development of the local community from Kalle Sjöberg and Hilkka Bergman from the Utö island commitee and regional museum. Hanna Kovanen guided us around the island and. We were also invited aboard as one of the pilots was taken out to a foreign tanker to guide it through the treacherous waters of the archipelago. In Korpo Nomeda and Gediminas were impressed by the project the local school had done with the marin biologist Christoffer Boström (Korpoström, Åbo Akademi). They also learned about the activities of the biosphere reserve from Katja Bonnevier. The visit ended with a dinner in Lanterna together with the local artists involved in CAA, Sussi Henrikson, Pia Rousku, Anna Nyreen and the CAA producer Micaela Jansson. Winter was turning to Spring, when Alfredo came over on his first visit. After a four hours-long drive from Helsinki airport we arrived in a grey and rainy archipelago of in-between seasons. The first night was spent on the island of Korpo, in Hotel Nestor. Our hosts, artist Pia Rousku (another participant in CAA) and designer Frank Hellgren, together with the artist Renja Leino (also in CAA) greated us and gave us a sense of the contradictions prevalent here – working with global issues, the latest technologies and actively developing cultural life in the peace of this now near-desolate landscape. The next day we took a four-hour boat ride to the island of Utö, the most southern inhabited island in Finland, a base for pilots, lighthouse keepers, custom officials and soldiers since the 17th century. The ice on the sea was melting and it was rather tricky to travel around the islands or even cross small stretches of water. We stayed in an army base turned hotel. In the evening we enjoyed a typical archipelago dinner of pickled herrings and white fish at the home of our host, Hanna Kovanen (a tourist operator, guide and contemporary lighthouse keeper) and her mother, Solveig Kovanen with guests Ari Saari, the head of pilots (Finnpilots), and the local school teacher Brita Willström. The sun was rising as we left Utö at 5.45 on Monday morning (the boat scheduled so early in order to take one boy to school in Korpo after the weekend at home in Aspö). In the end of the day we returned to Korpo for lunch out in the sun at the artist Antonia Ringboms (in CAA) home. The first visit Tellervo and Oliver made together with Henrik to begin their collaboration. On a day trip to Houtskär they met with Bengt Backman (former director of Houtskär municipality) and Martin Sainio (the local IT support amongst many other roles in the community). They also visited Stefan Karlgren on the side of his potato field, where the family was planting this year’s new potatoes, one of the best know products farmed on the islands. Henrik got stuck in Finland due to the Icelandic ash cloud for an extra day. On his way home to Sweden he gained thus an unplanned first-hand experience of the huge cruise ships that travel daily through the archipelago between Turku and Stockholm. The archipelago was covered under a deep blanket of snow when Elin came on her first site visit. Blindingly beautiful yet bitterly cold. No chance of excursions underwater, which was her prime interest from the start. But she did get an array of different perspectives into the ecology of the area in meetings in the island of Korpo with Trygve Löfroth (Metsähallitus) and Katja Bonnevier (the Archipelago Biosphere Reserve) and in Houtskär with Bengt Backman (director of the municipality) and the fishermen Fjalar and Patrik Johansson, father and son. Elin stayed in Lanterna in Nagu and with her host, the artist Sussi Henrikson (also participating in CAA). Together they visited the outer archipelago island of Jurmo, known amongst others as a sanctuary for migrating birds. 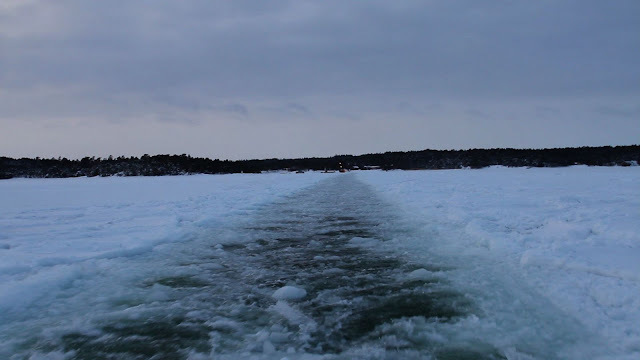 Due to the ice conditions, the boat could not reach the harbour but dropped the passengers off on the frozen sea, some dozen meters from the pier. The snow was here so deep they had to crawl to reach the small chapel of the island.